Today's ink is Diamine Cocoa Shimmer, from the Diamine Shimmertastic 2016 collection. I purchased my sample from Vanness Pens. Cocoa Shimmer is a warm brown with lots of gold shimmer. I think the color is great for fall/Thanksgiving time. If you look closely around the edges of the drops, there is some dark brown sheen in there, which totally surprised me. Water resistance: Medium, a lot of the ink washed away but you would probably still be able to figure out what it said. Bleeding: Low-only in the flex nib on Tomoe River paper. Other properties: Low shading, low dark brown sheen (you can only see it in flex writing on Tomoe River paper and large swabs), and gold shimmer. On 32 pound copy paper, there were two tiny spots of bleeding, but other than that the ink behaved perfectly. Ink swabs for comparison, left to right (top to bottom for mobile RSS): J. Herbin 1670 Caroube de Chypre, Diamine Cocoa Shimmer, and Robert Oster Golden Brown. Caroube de Chypre is a bit more red-brown, while Cocoa Shimmer is a bit more of a straight warm brown. Click here to see the Diamine inks together. 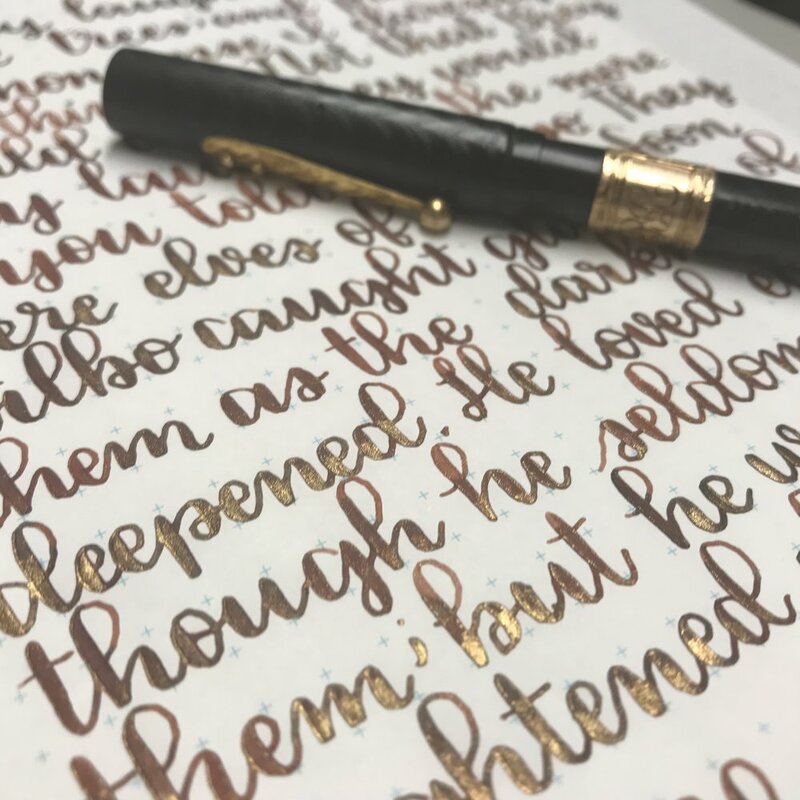 Diamine Espresso, Montegrappa Coffee Brown, and Diamine Ancient Copper. Click here to see the brown inks together. I used a Waterman's Ideal 52 1/2 with a #2 flex nib on Tomoe River paper. The ink felt a bit dry in this pen. It would do well for a line or two and then get really dry, so I would prime the feed a bit, and then it would write great again, so I wouldn't use this ink in a flex nib again. In the other nib sizes the ink had an average flow. Let me address pen choice here: I don't shy away from putting shimmer inks in vintage pens. Why? Because I clean out my pens within 24 hours of inking them. I review a different ink pretty much every day, so the ink doesn't sit in the pen long, and I am religious about cleaning my pens well. I think pens are meant to be used, and used often. Overall, the ink is a nice color, and it looks great with the gold shimmer, but it did have a little bit of trouble keeping up with the flex pen, so if I wanted a brown shimmer ink in a flex pen, I would use J. Herbin Caroube de Chypre. If I wanted it in a broad or medium nib, I might use this one instead.